Get ready to be wowed and surprised by Cyprus, an island offering so many more sights and activities than you'd expect from its modest size! A coast that seems sharp and rugged from afar is punctuated by pebbly little coves and vast sands – with the Blue Flag proudly flying high on many. Take to the seas and enjoy the thrill of windsurfing, the chill of a boat tour or a sensational spot of snorkelling. Inland you'll find forest-blanketed mountains and a timeless beauty in the rural villages, perfectly complemented by the native hospitality. Keep your eyes peeled for olive groves and vineyards, where zingy tipples and taste bud ticklers are lovingly produced by local hands. Historic gems and cultural heritage seem to be waiting around every turn, telling over 9,000 years of tales. From the ancient monuments to churches and monasteries – there's more than enough for history buffs! Open air museums let you bask in the Cypriot sun, as you roam around the ruins of Greek temples and take in Roman mosaics. Once the sun goes down, grab a slice of local life in traditional town squares. Delicious meals, inviting ships and Cypriot dancing and music – what could be better? 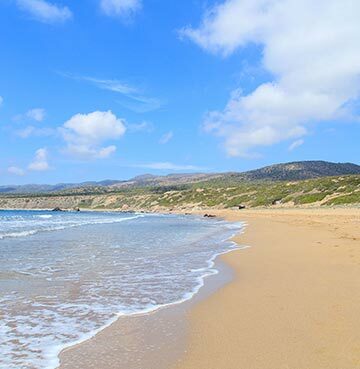 Located in the east of the Mediterranean, Cyprus enjoys a fairly typical sunny climate. Its closeness to southwest Asia means that in the summer months temperatures can soar into the 40s, so make sure to always use a good sun protection cream and avoid sitting in the sun for long periods. We've already given you a peek behind Cyprus' historic curtain, so it's time for you to whip it back and discover it all for yourself! 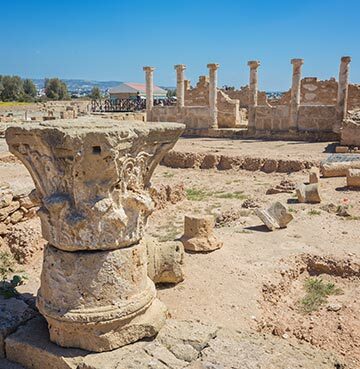 Kato Paphos Archaelogical Park is the only place to start, a whistlestop tour from prehistoric to Medieval with a hefty dose of Roman sandwiched between. The five Roman houses here feature mosaic floors telling ancient Greek tales – the most interesting history lesson you'll ever have! The fascinating Tombs of the Kings can be found here too but don't let the name fool you, there's been no royal visits. It is widely believed that Paphos aristocrats called this their final resting place. The ancient ruins of Kourion are some of the island's finest, with a lovingly restored amphitheatre and public baths to discover. For the inside scoop, check out our guide on the top things to do in Cyprus. If variety is the spice of life, then beach lovers will feel like they've got a whole new lease of it in Cyprus! The coves and bays here are as diverse as they are beautiful, so every taste is comfortably catered for. Just as nature intended, Lara Beach is where loggerhead turtles come to breed – so kick back and enjoy the simplicity. Aphrodite Beach puts captivating mythology just a shell's throw from where you set out your towel, so be sure to take the short journey to the Baths of Aphrodite! This is where the goddess of love came to bathe, or so the story goes. 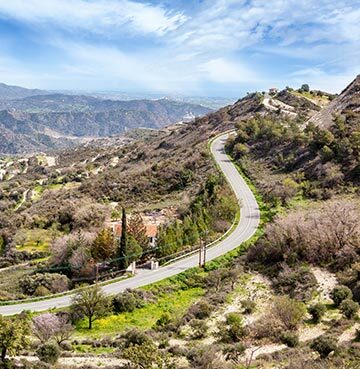 Pebbly Pissouri puts Paphos in easy reach, while Pachyammos is home to a quaint village and close to the Troodos Mountains – your trip to the beach could soon become a full day of exploration. Pomos is perfect for paddling, with its shallow waters making it ideal for family fun. Foodies will find kindred spirits in the Cypriots, who are truly passionate about what's on their plates! Mealtimes aren't just about satisfying hunger pangs – it's a time for socialising and savouring delicious flavours. And believe us, these are tastes well worth savouring! 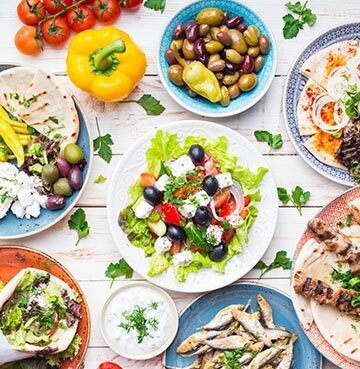 With Middle Eastern influences and flavours borrowed from Greece and Turkey, Cypriot cuisine is a truly delicious blend. Traditional tavernas still rule the roost, offering you the chance to try these native delights and immerse yourself in local life. Although Cypriots tend to head for dinner later, letting the temperature cool before they tuck in – so wait until eight if you're planning to dine Cypriot style. The only tricky decision is picking your dishes from such an appetising and eclectic menu! Succulent meats are skewered and grilled, or slow cooked in lip-smacking sauces, while vine leaves are stuffed with meat, vegetables and more. Hummus and Tzatziki are ideal for dipping, while cheesy diners can tuck into halloumi and feta. And that's before you get into all the fresh seafood, bakery-fresh pastries and island grown fruit and veg. High street or haggling? Markets or malls? Souvenirs or sweet treats? Luckily you won't have to choose in Cyprus, the island that caters to all your shopping needs! Impressive malls await in Paphos, Limassol and Larnaca, for all of you that love a splurge. From high end fashion to familiar favourites, shopping is a delight – Paphos' Kings Avenue Mall even has its own cinema and children's play area. 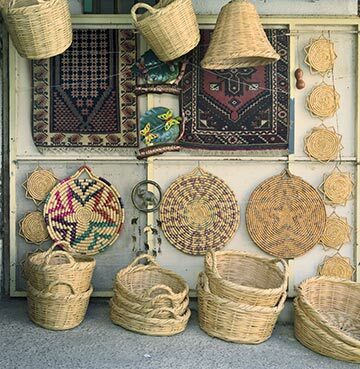 Markets take place in towns all across Cyprus, your one stop shop for tasty treats, cute trinkets and shopping the local way. Grab a handstitched table cloth for the kitchen back home, snag some jewellery for a loved one or pick up the ingredients for tonight's villa-cooked feast. A bottle of Cypriot wine is never a bad idea either - you'll soon be raising a toast to your new favourite destination and home from home. Road trips in Cyprus are a piece of cake! With English signs aplenty and cars driving on the left hand side of the road, you'll feel just as comfortable as you would behind the wheel of your own car. Making the most of that freedom to explore just got even better! Whether that means cruising along the coast, picking out amazing beaches for a sandy pit stop or driving up into the mountains, hopping out for whichever quaint village just caught your eye. 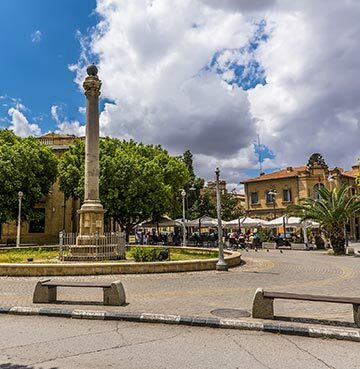 If you love long day trips be sure to head for Nicosia, a shining beacon of history and culture. Park up, take a stroll and discover the capital's fascinating story.